Leading international student CG awards The Rookies has launched Discover, a new part of its website listing the leading schools for VFX, animation, game design, motion graphics and illustration worldwide. The rankings are based on The Rookies’ 2018 awards, in which the work of 580 schools in 87 countries was rated by a panel of judges including Rob Coleman, head of 3D at Animal Logic, and illustrator John Howe. Globally, the USA’s Gnomon was rated best for VFX and animation, and SCAD best for motion graphics. Belgium’s Howest rated best for game development and Australia’s CDW Studios best for illustration. The new Discover section on The Rookies website enables users to drill down further into the data, providing lists of the top schools in the USA, Canada, UK, Australia and mainland Europe. The links can be found at the foot of the pages showing the global listings for each category. At the minute, it’s only possible to view rankings for the areas that have already been selected, but The Rookies tells us that it plans to make it possible to use custom search terms in future. 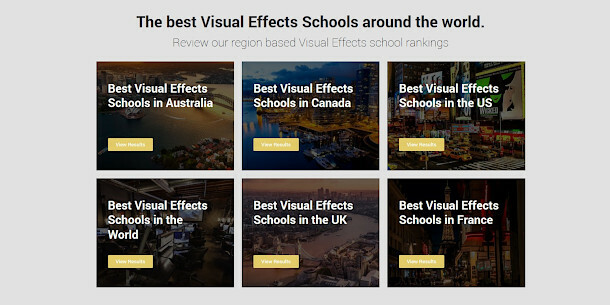 Are these the world’s top 100 CG schools?